FREE! 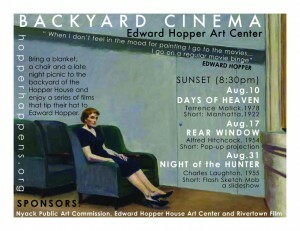 Bring a blanket and a late night picnic to the Edward Hopper House Art Center’s backyard for a series of classic films that tip their hat to Hopper. All shows at 8:30 PM. August 10, Days of Heaven; August 17, Rear Window; August 31, Night of the Hunter. Cosponsored by Edward Hopper House Art Center, Village of Nyack Public Art Commission, Rivertown Film. The Edward Hopper House Art Center is at 82 S. Broaday, in Nyack.